These babies are looooong overdue. I think I started them around this time last year. The hibernated for a while. And then when I picked up the torch this spring to finally get them done, I finished the left mitt, which fit perfectly, and then realized the right mitt was way, way too small. I tried blocking them to see if they’d stretch but no luck. So after much debate I decided to start the right mitt over, and cut off the cuff of the original so that at least I could skip doing that part over again, as I knew trying to unravel the mitt from the top, after all its ends were woven in, would only end badly — in say, a trip to the psych ward. It’s quite hard to get the right tension when doing colour work, but I think I’ve been doing enough lately, what with the socks, that I’m finally getting the hang of maintaining very light tension, which seems to be the key to success. Unfortunately I’ve been experiencing some carpal tunnel lately, especially this past weekend, so the knitting is on hold for a while. Unfortunately I don’t think my sewing is really doing me any favours in this regard, either. So much for my great idea that sewing would take the pressure off any repetitive strain from my knitting. I’m trying to stay off the keyboard as much as possible too, although that’s pretty hard when you work an office job. 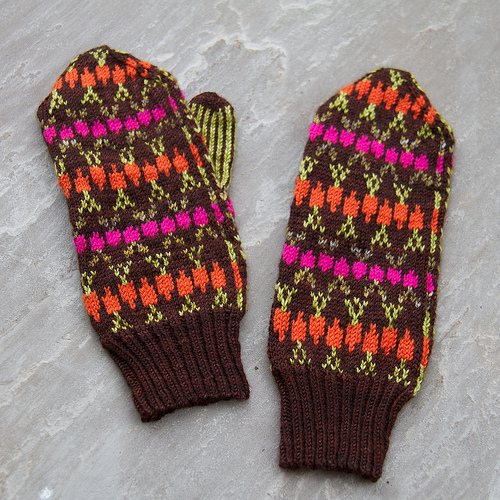 Anyhoo, there are some small mistakes in these mitts, and I really wish they had a thumb gusset. If I were to make them again ever, I’d figure out a mod to include one. I just don’t like how restrictive they feel in the thumb area. But they are so cute, I have to overlook it. 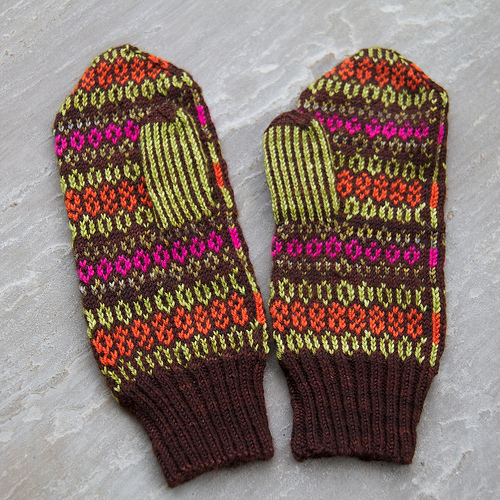 These are designed by SpillyJane Knits, based in Windsor, Ontario. She has the most amazing colourwork designs, although if I’ve learned anything, I need to size up her patterns a bit as they seem to be on the small side. The greens and brown are Malabrigo sock yarn in Lettuce and Turner, and Cordovan, and the pink and orange are Debbie Bliss Rialto 4ply. It looks like spring is really on the way, with a high of 8 degrees C expected tomorrow, so I likely won’t need them for long but they’re just the thing to get me in the spirit of gardening season.